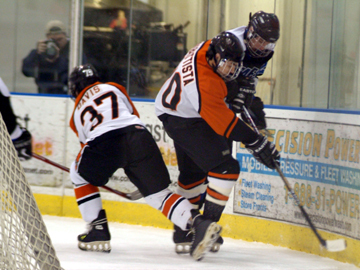 Central Bucks West scored three unanswered goals in the second period and turned a 2-1 deficit into a 5-2 victory over Cherokee. Mike LeClair netted three goals and Eric DeFelice added two goals for CB W, Tom Paradise and Frank Garvey scored the Cherokee goals. After LeClair scored in the games first minute, Paradise and Garvey gave Cherokee a 2-1 lead after the first period. CB West took control midway through the second period scoring three goals in a span of six minutes to take a 4-2 lead into the third period. 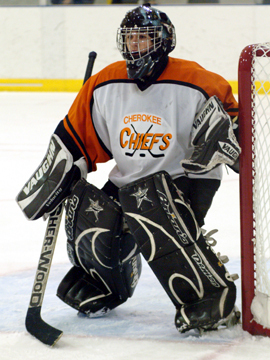 Cherokee goalie Doug Ball did his part in the third as CB West launched 20 shots, allowing only one goal, LeClairs' third, and Cherokee could only manage 8 shots. Shawnee rallied from a 3-1 deficit scoring four power play goals and defeated Cherokee 5-4 and advanced to the championship round against Washington Township. Cherokee jumped on Shawnee from the opening face-off and controlled play for much of the first period and Brian Taylor put them up 1-0 converting a drop pass from Kyle Kovervas five minutes into the game. About three minutes later Justin Kinniry's slap shot beat Paul Gray to the short side and Cherokee led 2-0 and was dominating in shots at 14-2. Shawnee finally got some offense on the power play as Connor Dragone deposited a rebound of a point shot by Christian Ayres with just over five minutes left in the period. That goal was huge as despite Cherokee controlling play the lead was just 2-1, thanks in large part to Gray who made some big saves early on. There's something to say about playoff basketball in how the level of competitiveness on the court creates an excitement enjoyable for all fans in attendance. The Cherokee Chiefs were hosting the Lady Indians from Pennsauken during the first round of the South Jersey Group IV girls' basketball tournament. What appeared during the early moments of this game as if the Lady Chiefs would have an easy time against the fifteen seeded Indians, Pennsauken just would not give up and worked their way back into this game at the end of the first quarter. But as this game when on, the second seeded Chiefs' defense set the tone for the rest of this game. 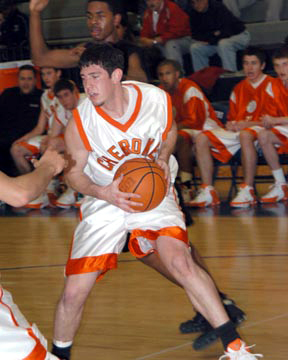 Cherokee held their opponent to nine points through the second and third quarters and cruised to a 71-41 victory. 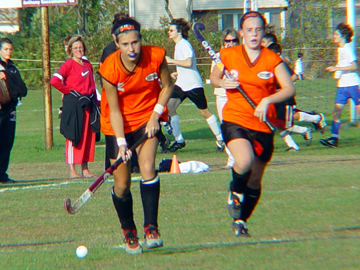 Cherokee used eight different goal scorers to defeat Williamstown 8-3 and advanced to the final game in the losers' bracket. They will play Shawnee Monday night at Voorhees, with the winner advancing to the championship round against Washington Township. Williamstown took there only lead of the game as Dennis Cunard scored a power play goal midway through the first period. Cherokee would score the next five goals to take control of the game. After Frank Garvey tied the score at 1-1, neither team would score any more goals in the first period. The second period began with Williamstown on the power play, but Brian Taylor scored short-handed to put Cherokee up 2-1 just eleven seconds into the period. Goals by Matt Maugeri, Kyle Manny and Kevin McMahon put Cherokee ahead 5-1. Today we should be talking about how Clearview fell behind 4-0 after one period and was out-shot 20-6, but rallied to within 4-3, only to lose 5-3 to Cherokee and thus ending their season. Instead we are left with a scene of players trying to fight, parents and coaches on the ice to try and restore order and more ammunition to the school decision makers as to why high school hockey in South Jersey will never be sanctioned. For the most part the game was clean and well officiated, and the outcome was in doubt until Frank Garvey was credited with a goal as he skated towards the empty net, but was dragged down from behind. That goal iced the game at 5-3 with twenty five seconds left. Joe Scafisi stopped thirty eight shots as Washington Township opened defense of its league title with a 4-2 win over Cherokee. After being off for two weeks, Township started out slow in the first period only managing four shots, Cherokee controlled the play for most of the period, taking the body and shadowing talented playmaker Colin Davis. 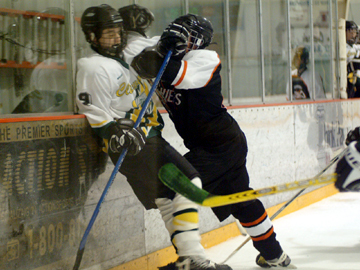 The second period was a different story as Davis had a hand in Townships' three goals in the first five minutes. Christian Fleagle put Township up 1-0 with Davis and Jared Emmet getting the assists. Moments later the same three hooked up again this time Emmet getting the goal. Frank Garvey and Justin Kinniry scored three goals each as Cherokee routed Cherry Hill East 11-0 in an opening round game in the double elimination tournament of the South Jersey High School Ice Hockey League. The score was only 2-0 after the first period as Cherokee got goals from Garvey and a short-handed goal from Brian Taylor. The lead grew to 5-0 after two periods as Kinniry, Garvey and Dan Weiner scored in a five minute span. Cherokee broke the game open in the third period as Kinniry, Garvey and Kyle Kovervas each scored three minutes apart early in the period. Kinniry, Kyle Manny and Angelo DiBattista also tallied for the Chiefs. Evan Betz stopped all twenty shots as West Deptford defeated Cherokee 2 at Hollydell, 5-0 in Tier 2 competition on Friday night. West Deptford scored twice in the opening period, one on a slap shot by Flood and the second goal on the power play by Cory Jackmuff. Anthony DeSimone got into the scoring column late in the second period as West Deptford built their lead to 3-0, DeSimone also delivered a few crunching checks as well. West Deptford added two short-handed goals in the third period, one by DeHart to complete the impressive win over Cherokee, who suffered just their second loss of the season. Kyle Manny and Justin Kinniry scored three goals each and Tom Paradise added two goals and two assists as Cherokee flew past Eastern 11-1 in action played at the Skate Zone in Voorhees. Having been a successful organization over the years the Vikings have struggled these last few years and instead of battling for the top spot, they find themselves near the bottom of the standings, and probably in Tier 2 next season. Thanks to the mercy rule, where a team with a 10 goal lead will be declared the winner, the game was stopped early in the third period when Ryan Thompson scored the eleventh goal. Torin Lawson scored the lone Viking goal. 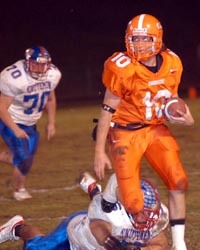 Kevin McMahon also scored twice for Cherokee. Even before the teams stepped out onto the court, you could see the flowers and balloons for the anticipated celebration for Cherokee's Laura Sweeney 1000th point being scored. Sweeney would reach that milestone on her third basket of the game. When the host Lady Indians from Lenape watched that celebration lead to the Chiefs taking a double digit lead into the second quarter, Lenape's defense aggressively began to pressure their opponent and reduced their deficit to four points at halftime. The game would come down to the Lady Indians aggressive play on the boards and two clutch free throws down to stretch. Lenape would extend their winning streak to four games with their 53-50 win over a very tough Cherokee squad. Cameron Rowand snapped a 5-5 tie scoring on a rebound with forty seven seconds left in the game as Washington Township rallied from a 5-3 deficit and defeated Cherokee 6-5 at the Skate Zone. 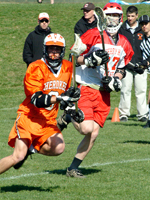 Colin Davis led the Township attack scoring two goals and handing out three assists. Davis scored a highlight goal on the power play early in the third period as he flew down the left wing and cutting into the slot faked the defenseman and somehow held the puck on his stick and quickly put the puck in the net. The game was back and forth as Davis put Township up 1-0, but Mat Maugeri on a nice pass from Frank Garvey tied the game at 1-1. Kyle Manny scored a goal late in the period and Cherokee took a 2-1 lead into the second period. Matt Maugeri scored twice and assisted on two more as Cherokee swarmed Timber Creek 9-0 at Hollydell on Friday night. Kevin McMahon added two goals and Frank Garvey had a goal and three assists. Maugeri scored the only goal of the first period as Garvey found him all alone in front. 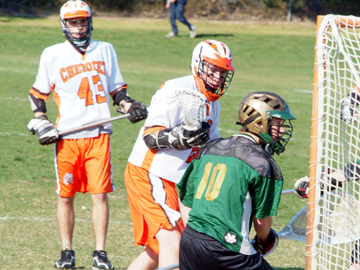 Cherokee broke the game open scoring five goals in the first six minutes of the period. Ryan Thompson made it 2-0 early in the second period and Kyle Kovervas added a goal forty seconds later for a 3-0 advantage, scoring on a breakaway. 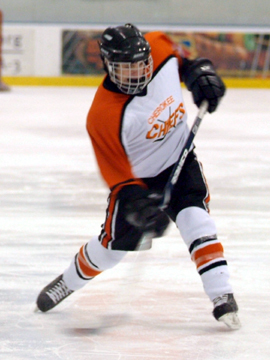 Justin Kinniry had two goals and Matt Maugeri added a goal and an assist as Cherokee defeated Shawnee 6-3 in Tier 1 action on Monday night. It was Shawnee's first loss after seven straight wins and they had also given up the least amount of goals, 12, coming into the game. Cherokee jumped on top early as Kinniry scored in the opening minute and after adding a power play goal Cherokee seemed to be in control. But Shawnee would score the next three goals to take a brief 3-2 lead. Joe Paradise scored with just over four minutes remaining in the game as Holy Cross and Cherokee 2 played to a 2-2 tie at the Skate Zone in Voorhees. After Nick Petitte and Anthony Carr exchanged goals in the first period, neither team could score in the middle stanza, thanks to good back checking and solid goaltending by both teams. John Gidel gave Cherokee a 2-1 lead early in the third period as he jammed home a short side shot. With Holy Cross on the power play, Petitte set-up Paradise for the tying goal, and Holy Cross hung on for the tie. With the point Holy Cross maintains a one point lead over Cherokee, with Cinnaminson closing fast. Pennsauken has had its share of good and bad times during this season that begun with high hopes and a chance at a group title. Six games into their season, the Indians found themselves in a football game that they had to win in order to qualify for the playoffs. The Chiefs from Cherokee had only one loss on the season and they were on their way to another win leading at the break by a touchdown. A second half comeback lead by led by Wendell Johnson's two rushing touchdowns gave Pennsauken a lead late in the game. The Chiefs had the ball late in the game with a chance to tie it but an interception by the defense would be able to preserve the win. The Indians' 22-14 win over Cherokee has secured them a position in the upcoming South Jersey Group IV playoffs. The seedings listed Cherokee as the underdog in their game against the Lady Lions from Cherry Hill West. This semi-finals girls' Central Jersey Group IV playoff game gave the Chiefs more than enough reasons to prove that they were a lot better than their regular season record had indicated. The eighth seeded Chiefs surprised Cherry Hill West by taking a three goal lead at halftime leaving the fifth seeded Lions in search of a second half comeback. Cherokee would continue to stay ahead in this game and advance to the sectional finals with their 4-1 victory. Liz Fox scored twice for the Chiefs and now move into the sectional finals against Rancocas Valley. Justin Kinniry scored two goals and Doug Ball stopped all 20 shots as Cherokee defeated Cherry Hill East 4-0 in Tier 1 action played in Voorhees. After a scoreless first period, Kinniry got Cherokee going as he picked off an errant clearing pass in the East end and slid a backhander along the ice for 1-0 lead. The goal came in the middle of a Cherry Hill power play. Cherokee took advantage on their power play midway through the period as Tom Paradise scored with Zach McCarty getting the assist. Cherokee continued the offensive pressure, but East goalie Mike London made several great saves to keep his team close. Washington Township opened defense of its title with an 8-1 win over Cherokee in a game played at Hollydell on Friday night. TJ DiSpaldo led the offensive attack scoring three goals and Christian Biscardi added two goals. Cherokee seemed to be a step slow all night as Township got to all the loose pucks and had several odd-man rushes. Five minutes into the game DiSpaldo scored his first goal off a 2-on-1 break with Biscardi getting the assist. Later in the period Christian Fleagle scored the first of three power play goals for Township to make it 2-0. Late in the period with Township putting on good offensive pressure, Tom Roche's blast from the point through a screen found the net and after one period Township led 3-0. When the Cherokee Chiefs boys' soccer team arrived at Eastern High School, you could see how confident they were before the start of their game against the Vikings. As a team playing as a single unit, Cherokee does possess the talent to defeat any opponent they compete against on the field. But so does the Vikings. During the first half of this game, both teams aggressively were determined to win every ball and setup for a chance to score. Eastern's Harry Middleton would get his foot on a loose ball in front of the net and score the eventual game winner. Both teams continued their physical play during the second half, but the Vikings would walk away with the 1-0 victory. 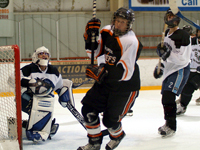 The Olympic Conference American Division has teams that have demonstrated their ability of scoring goals. 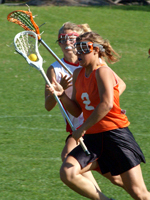 Three of those teams have been considered as top ranking girls' lacrosse teams in our area while Cherokee and Cherry Hill East were not that far behind. Each and every team from that division could qualify for the post season, but they will have to prove it on the field down the stretch. Both of these teams were in search of their first division win. Proving that they can maintain possession of the ball, the Lady Cougars would be able to hold off Cherokee during the second half. Sam Stern would score six times helping Cherry Hill East to pick up the 12-6 victory. With the start of a new season, the Cherokee Chiefs boys' lacrosse team would be looking to improve on advancing further into the post season tournament and that would include defeating the Renegades from Shawnee. For several years, Shawnee has not only defeated the Chiefs in every game but they have also dominated the sport. Well, with the new season upon us, new beginnings can occur and the Chiefs finally were able to defeat Shawnee earlier in the week. So that was not good news for the Fighting Irish from Camden Catholic who traveled to Cherokee looking to pick up their second win. Matt Dunn was able to muscle his way past the defense and score a total of five goals helping the Chiefs pick up the 15-2 victory. 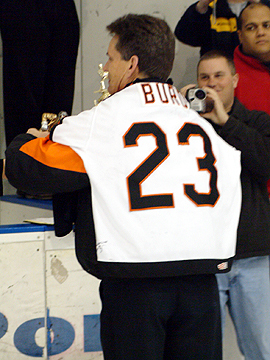 Chris Coleman scored two goals as Washington Township defeated Cherokee 4-3 and won the SJHSIHL Tier 1 Championship before a standing room only crowd at the Skate Zone in Voorhees. The season ended in disappointment for Cherokee as they went unbeaten during the regular season, but it was Township that went undefeated in the double elimination tournament. And for the first time in a long time, it was goaltending that carried Washington Township as Joseph Scafisi was the difference in nets. Christian Biscardi scored with six minutes left in the game as Washington Township rallied to defeat Cherokee 5-4 in a battle of two undefeated teams in the double elimination tournament. With the win Township now moves into the finals, Cherokee will face Moorestown and the winner will play Township for the championship. This was a playoff game that had everything you want, hard hitting, great goaltending, end-to-end action and minimal penalties, and played in front of a packed house. Cherokee jumped out to a 2-0 lead in the first period scoring two goals in less than a minute, first Justin Kinniry scored on a short-handed breakaway, then at the end of the power play, Matt Cardillo scored on a breakaway and just seven minutes into the game and a 2-0 lead it looked like Cherokee was going to run away from Township. The winner's bracket of the SJHSIHL had narrow itself down to just four teams and those teams advancing to the semifinals were Cherokee, Washington Township, Moorestown and Williamstown. 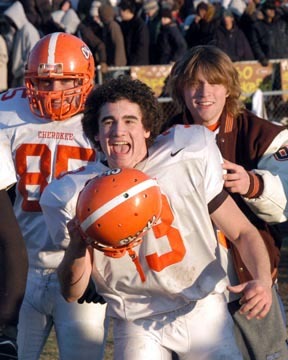 During the Cherokee versus Williamstown game, both of these are capable of putting goals on the scoreboard. Right from the beginning of this game, Williamstown's objective was to match Cherokee's intensity, speed and physical play in order to defeat the defending champs. Kyle Manny would score Cherokee's first two goals of the game and they would not relinquish their momentum or their lead for the rest of the game. Cherokee would go on to defeat Williamstown 7-2 and advance to the finals of the winner's bracket against Washington Township. The Chiefs from Cherokee and Middle Township had the opportunity to watch all of or some of the first four games scheduled before them during the day at the Cape-Atlantic Challenge boy's basketball tournament. Hammonton defeated Triton to start the day off and then Pennsauken, St. Joseph and Camden Catholic were the winners of their games. With the Cape Atlantic Conference and Olympic Conference both even at two games apiece, Cherokee would give their conference another win as they defeated the Panthers from Middle Township by a 52-39 margin. It was a playoff game atmosphere before the upcoming state basketball tournament even began. Lenape, already with the Olympic Conference American Division title in hand, traveled to Cherokee in a battle between the two teams leading their division. Both of these teams have secured a position in the state tournament, but this game was about bragging rights. With a pack gymnasium and the Chiefs leading by double digits, the Lenape fans would watch the Indians pull with a point late in the quarter. Cherokee would then end their scoring drought and hold off Lenape and post a 52-49 win. The second round of the SJHSIHL began with Cherokee 2, fresh off of their victory against Paul VI, traveling to the Igloo to take on Moorestown. Enjoying their first round bye, the home team appeared to have the early momentum as they would take the early one goal lead. Cherokee 2 would respond by not only tying the game but also by taking a one goal lead heading into the third period. Colin Corley tied this game for Moorestown early in the third, but after that goal the two goalies, Stephen Broadt and Max Paluszynski, turned away every shot headed towards the net. It took an overtime period to decide this game and when Mike Weaver's second goal of the game crossed the goal line, Moorestown would begin to enjoy their 3-2 victory. Year after year, the SJHSIHL had some very competitive battles through out the season in order to determine which team would be the best in South Jersey. This year might be a bit different, but it's always interesting when two teams from the same school are scheduled to meet in the ice. 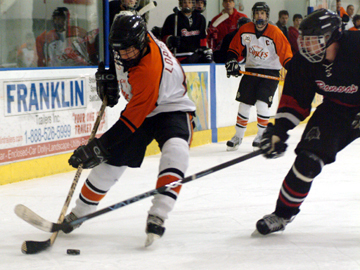 When defending champs Cherokee 1 competed against Cherokee 2 at the Skate Zone in Voorhees, it appeared as if this game could have a different result than the first time these two teams met earlier in the season. Cherokee 2 would get the game's first goal on a power play, but Cherokee 1 would score four unanswered goals through the first and second periods to take a 4-1 lead. Cherokee 2 would come within a goal, but the end results would see Cherokee 1 holding onto a 6-4 win extending their unbeaten streak to 16 games. Matt Cardillo had a hat trick and Justin Kinniry added two goals as Cherokee defeated Williamstown 7-1 in SJHSIHL Tier 1 action at Hollydell. The opening period was played very tight and the only goal came from Cardillo, who while on his knees in the slot fired the puck at the net and somehow it went in and Cherokee led 1-0. Cherokee took over in the second period, first Patrick McMahon sent in Kinniry on a break and his goal put Cherokee up 2-0 early in the period. The way the Chiefs from Cherokee finished the regular season to qualify for the group tournament was a separate story in itself. After losing their first two games of the regular season, the Chiefs were faced with a must win situation each week they took the field. That sense of urgency but with a great deal of patience allowed Cherokee to compile a winning streak against some very good football programs. Absegami would be that final test that the Chiefs had to pass and it didn’t start the way they wanted. Trailing by 19 points, Cherokee managed a comeback that will be remember for a very long time that sent this game into overtime. A touchdown in overtime and a defensive stop of the Braves capped a very successful season for Cherokee as their 32-25 victory allowed the Chiefs to hold the South Jersey Group IV trophy high above their heads. Chris Martin connected on the power play midway through the third period as Moorestown rallied to tie Cherokee at 2-2 in Tier 1 action played at the Skate Zone in Voorhees. After a scoreless first period, Matt Cardillo gave Cherokee a 1-0 lead with Justin Kinniry assisting. Moorestown tied the game at 1-1 less than three minutes later as Mike Harrigan beat Joe Allen. It was like a college game played in a high school arena with the bands playing their fight songs, the cheering of the fans from both sides of the stadium and competitive football being played on the field. Whenever the Renegades from Shawnee and the Chiefs from Cherokee get together for any sport, expect a very large crowd in attendance trying their best to do what they can to make their team come out victorious. But in this South Jersey Group IV semifinals game, the home fans just couldn’t cheer loud enough for the Renegades to rally from a 13-10 deficit late in the game. The Chiefs would hold onto their three point lead and advance to the finals and play the winner of the Absegami against Pennsauken semi-finalist. Patrick McMahon scored with fifty-one seconds left in the game as Cherokee rallied from a 4-2 deficit and defeated Washington Township 5-4 in a battle of two of the best teams in Tier I. Township led most of the game, scoring three goals in the first period as Andrew Rohach, Thomas Dispaldo and Christian Biscardi scored over a seven minute span to give Township a 3-0 lead. Cherokee scored a late goal as Dan Maugeri scored his sixteenth of the season to make it 3-1 after one. Tom Ruiz scored two goals and Joe Altamuro stopped 25 shots as Williamstown rallied from a two-goal deficit to tie Cherokee 3-3 in an intense and hard hitting game played in Voorhees. In a game that featured the only two teams without a loss and a possible preview of the championship series, Williamstown proved that they are a team to be reckoned with. After Justin Kinniry and Scott Weiner put Cherokee ahead 2-0 just five minutes into the game, Williamstown could have panicked and start taking silly penalties, but they kept there heads and given a two-man-advantage in the closing seconds of the period, Ruiz banged home an important goal to bring his team to within 2-1. It’s not that easy being labeled as one of the best teams not only in our area, but also in the state. So what kind of pressure would a team have when they have been considered the fifth best team in the country? The Lady Vikings from Eastern was that team taking on the competition’s quest to see what it takes to defeat a highly ranked field hockey team. Cherokee would be next in line looking to pick up an important win with the cutoff date to make it to the playoffs only days away. Eastern broke this Olympic Conference game wide open at the start of the second half with two quick goals and went on to defeat Cherokee by an 8-0 margin. With the win, Eastern has now captured their seventh straight Olympic Conference American Division title. The Golden Eagles from Seneca have so far demonstrated what it takes to win games. Good defense, solid pitching and key hitting are three of many aspects of the game that will reward the coaching staff with a team victory. 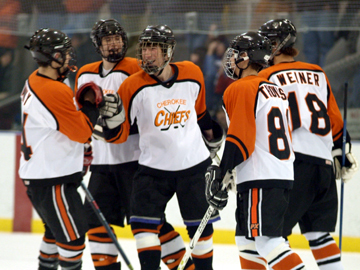 On this day, the Chiefs from Cherokee were the visiting team looking to end Seneca’s ten game winning streak in an Olympic Conference match-up. Starting pitcher Ryan Brecko would pitch a complete game for the Golden Eagles giving up just two run and striking out eight batters. A three run sixth inning finally decided this close game for Seneca as they extended their winning streak with a 6-2 decision. 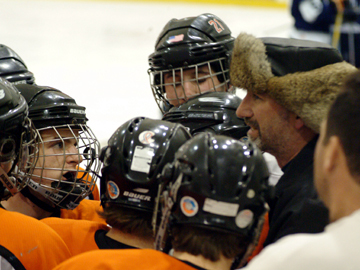 There are different ways a coach prepares their team before each and every game of the season. When the players take the field at the start of the game, Cherokee coach T.J. Viereck had to somewhat change his philosophy a bit after a loss. The Chiefs went down in defeat to a more experienced team in Ramapo in the last game and were taking on a new boy’s lacrosse team in the Cougars from Cherry Hill East. Knowing they were the heavy favorites to win, the Chiefs worked on their passing and motion plays rather than the finesse game. With that patience and letting the game come to them, Cherokee posted early goals by Matt Dunn, Eric Olson and Kevin Sterling to win this game by a 14-1 margin. When the Lady Chiefs from Cherokee took the field against Lenape in an Olympic Conference American Division softball game, it was a strange site to see their previous coach standing on the opposite side of the field. Mike Medrick, who had coached Cherokee to a 28-0 record and a couple of titles two years ago, was now the head coach for Lenape. But in this game, the players are the ones on the field working hard at coming away with the victory. Lenape would tie this game in the eighth inning to extend the game even further and then win it in the bottom the tenth when Jamie Moir’s single drove in her sister Kelsey for the winning run and a 4-3 victory. Led by their top line of Patrick McMahon, Lou Sarcone and Justin Kinniry, Cherokee skated to an easy 6-1 win over Washington Township and won its second title in four years. With the familiar #23 jersey worn by Jeff Burd, hanging behind their bench, this emotionally driven group of young men, with one goal in mind, got stronger with each game. Coach Rumbus prior to the game told his players that this was the last year that Jeff's name could go on the trophy, but to go out and also play for each other. 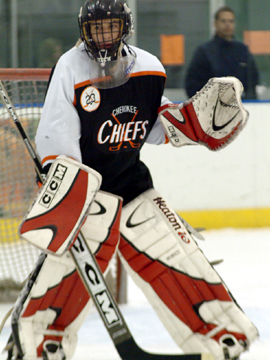 Cherokee goalie Bobby Casolaro played a strong game in nets, while the top line accounted for eight points, with McMahon and Kinniry scoring two goals each. Justin Kinniry, Patrick McMahon and Lou Sarcone, combined for 12 points as Cherokee rolled over Washington Township 10-6 in championship playoff action at Hollydell. 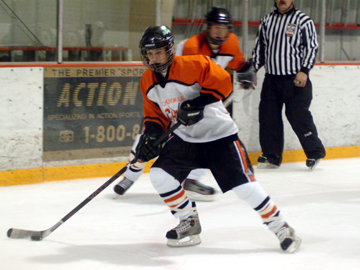 In handing Township its first loss in the double elimination tournament, Cherokee will now host Township on Wednesday night at the Skate Zone in Voorhees. Fred Brewer scored three goals for Township and Kinniry also had a hat trick for Cherokee. Township will need stronger play from their defense and better goaltending, but that still might not be enough as this Cherokee team has raised its level during this tournament. After Brewer gave Township its only lead at 1-0 early in the game, Cherokee scored twice in less than two minutes to take control of the game. 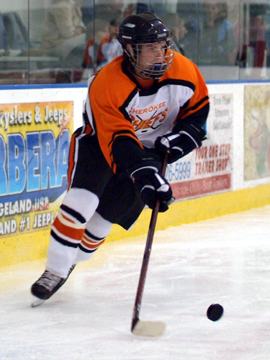 First Sarcone broke in with defenseman Steve Sheridan, who had a solid game for Cherokee, and after drawing the defenseman over Sarcone slid the puck to Sheridan and his one-timer beat Matt Corvino and tied the game at 1-1. Cherokee rallied from a 5-3 deficit, scoring four goals in the final eleven minutes, to upset top seed Moorestown 7-5 and move into the final round against Washington Township. Lou Sarcone led the attack with four goals and Matt Loprete added two, Moorestown had goals from five different players. In front of a standing room only crowd at the Skate Zone in Voorhees, both teams came into the game knowing that if you lose your season is over. Super sophomore TJ Brennan put Moorestown on top early in the game as his slap shot along the ice found the long side corner for a 1-0 lead. Cherokee had some opportunities to tie but Colin Higgins stoned Zach Sawyer and Pat McMahon to keep Cherokee off the board. Late in the period Cherokee had a two-man advantage, but excellent penalty-killing by Kevin Schaffer and Mike Bodine denied Cherokee. Bobby Casolaro stopped 34 shots as Cherokee defeated Rancocas Valley 3-2 in playoff action at the Skate Zone in Voorhees. Cherokee will now meet Moorestown, with the winner advancing to play Washington Township in the championship round. Rancocas Valley took its only lead at 1-0 one minute into the game as Patrick Hennessey was set-up by Aaron and Ryan Smith. Patrick McMahon with a nifty move down low tied the game at 1-1 for Cherokee about four minutes later. With both teams playing stay at home defense, the period ended at 1-1 and the shots were even at nine. Four different players scored goals in the first period as Cherokee 2 continued its mastery over Paul VI with a convincing 6-2 win in playoff action at Hollydell. It was the third straight time this season that Paul VI has lost to Cherokee 2, twice in the playoffs. 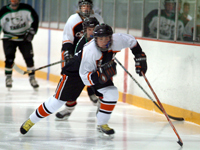 Matt Cardillo paced the offensive attack with two goals and an assist for Cherokee 2. Brett Doyle and Dustin Isbert scored the goals for Paul VI. Cherokee scored right off the opening face-off as Shane Kelly broke down the middle and after Eric Lake made the initial save, Cardillo was there to put home the rebound and nine seconds into the game, Cherokee led 1-0. Chris Keyser scored three goals to lead Washington Township over Cherokee in a tense playoff game at Hollydell on Friday night. With the win, Township advances in the double elimination tournament and will meet Moorestown at the Igloo on Monday night. These teams are the only remaining undefeated teams left in the winner bracket, and the victor on Monday night will advance into the championship series. Shawnee had its season ended abruptly as Cherokee 2 skated to a 6-1 victory on Monday night in tournament action played at the Igloo. Cherokee 2 now advances to the next round and will face Paul VI at Hollydell on Friday night. Shawnee, coming off a 10-5-3 season and a berth in the Flyers Cup, could not muster much offense in the playoffs, scoring just 5 goals. Cherokee 2 has played solid defense and enjoyed hot goaltending by SJ Broadt. Mike Prince led the attack with two goals as Cherokee jumped out to a 3-0 lead after the first period and never looked back. Fred Brewer had a goal and three assists to lead Washington Township over a very tough Cherokee 2 squad 6-2 in second round playoff action at Hollydell on Wednesday night. After having a bye in the first round, Township drew Cherokee 2 fresh off its defeat of Paul VI on Monday night, thanks in large part to the stellar play in nets by S.J. Broadt. And after a scoreless first period, Broadt was still on his game turning away all 12 shots. Marco Jordan got Township on the board early in the second period on a nifty pass from Brewer and Chris Keyser. Matt Corvino, playing well in nets for Township, made that lead stand until the last three minutes of the period. With Cherokee down a man, Shane Kelly was sent in by Matt Cardillo and Steve Dellavecchia, and his short-handed goal tied the game at 1-1, heading into the final period. In a battle of goaltenders S.J Broadt was just a little better than Eric Lake as Cherokee 2 defeated Paul VI 2-1 in an opening round playoff game of the SJHSIHL playoff tournament. Broadt stopped 39 of 40 shots and Lake faced 32 shots and allowed just the two goals. After Rich Ferro gave Paul VI a 1-0 lead with just under four minutes remaining in the first period on a slap shot from just inside the blue line, Cherokee’s Kyle Manny tied the game on a feed from Dan Maugieri two minutes later. Heading into the second period the atmosphere had the feel of playoff hockey and both teams were hitting. Two teams from two different division chasing two different leaders met on a basketball court in Marlton looking to add one more game to their win column. The Fighting Irish from Camden Catholic were looking to extend another winning streak to three games after losing to the division leading Camden. In their inter-conference battle against the Chiefs from Cherokee, the Irish jumped out early establishing a twenty point lead in the first half. 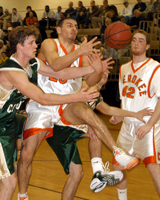 Cherokee would battle back in the second half only to see Camden Catholic break the game open in the final quarter. The Irish cruised to their 69-54 victory to keep pace in the Olympic Conference National Division. Chris Riggs scored four goals and assisted on two more as Clearview defeated Cherokee 2 at the Skate Zone in Voorhees by a score of 8-3. Cherokee broke out on top early in the first period as Tom Paradise gave the Chiefs fans something to cheer about just over three minutes into the game. Riggs responded sixty seconds later on a give and go with Mike Sullivan. Less than three minutes later those same two hooked up again, this time Riggs fed Sullivan and his quick shot put Clearview on top 2-1. The ultimate goal of winning every game put in front of a team is to completely outplay your opponents and go undefeated for the entire season. Cherokee had won its first seven games of the season before losing back to back games against Olympic Conference teams. 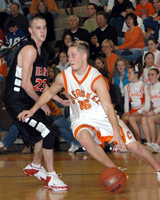 Since then, the Chiefs made up those losses and were looking for a third win in a row at Pennsauken High School. During their opening minutes of this American Division game, Cherokee scored the first eight points and never looked back. Outscoring Pennsauken in every quarter, Cherokee’s balanced scoring resulted in an 88-63 victory. Lou Sarcone scored on a breakaway as time expired and Cherokee rallied from a 4-3 deficit in the last ninety seconds to defeat Washington Township 5-4 and hand Washington Township their first loss of the season. 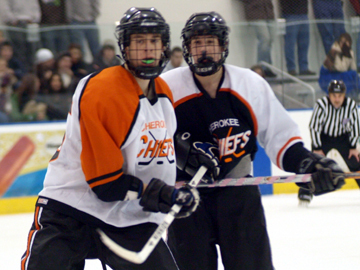 Fred Brewer led Township with two goals and Pat McMahon scored twice for Cherokee. Brewer scored the only goal of the first period on the power play, picking the top corner. McMahon then scored his two goals in a sixteen second span, his second one on a breakaway to put Cherokee up 2-1 early in the second period. When you ask coaches what are the keys to being successful, usually they will answer, goaltending, defense and success on special teams and last night Moorestown had all three working as they defeated Cherokee 4-1 in front of a packed house at the Skate Zone in Voorhees. The first ten minutes of the game was a feeling out process, with neither team wanting to make a mistake, and both goalies making solid saves, Bobby Casolaro for Cherokee and Colin Higgins for Moorestown. Zach Sawyer gave Cherokee its only lead scoring with just over four minutes remaining in the period but Moorestown responded three minutes later as Mike Furey beat Casolaro from in close. 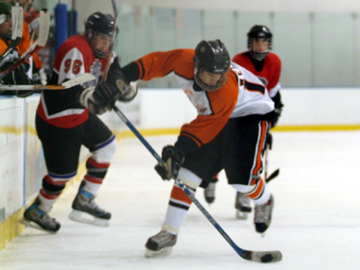 Nine different players scored as Cherokee rolled over Highland 10-0 in the South Jersey High School Ice Hockey League action at the Skate Zone in Voorhees on Monday night. Cherokee scored six goals in the first period and never looked back and were led by Patrick McMahon with two goals and two assists, Dan Altieri and Angelo DiBatista added a goal and an assist. One can only wonder if the league will wake up and correct this unbalanced schedule. For example, the two games we saw last night would have been more competitive had they switched opponents. How does one really evaluate whether a team has been upset by another? Sure the seeding helps by labeling a team’s success before the playoffs begin, but what about that team doing the upsetting? 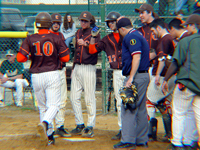 In a semifinals game at Cherokee High School, the second seeded Chiefs were looking to keep the South Jersey Group 4 bracket the way the seeding were indicated. On this night, the sixth seeded Minutemen from Washington Township was the top team moving into the finals against Shawnee with their 14-12 victory. Township used two second half scores to take the lead for good. A statement is sometimes made when a team uses a disappointing lose and turns it into a well played game in which the outcome is a win. Sure, it's nice to play well but a victory to go with it...priceless. Cherokee was shutout last week by Shawnee and were looking to ease that painful loss with a win against a team that needed this game to try and qualify for the postseason. Winslow Township needed to pick up some power points and the Chiefs were the team that could allow them to earn it. But the Chiefs were determined not to lose two games in a row and the Eagles would fall to that determination losing by a 30-6 score. Lou Sarcone and Patrick McMahon scored goals on breakaways late in the second period to break a scoreless tie and propel Cherokee to a 4-2 win over previously undefeated Clearview at Hollydell on Friday night. After a scoreless first period, thanks in large part to Bobby Kovarovic in nets for Clearview, Sarcone broke the tie as he was sprung by Steve Sheridan breaking out of the zone with less than five minutes left in the second period. 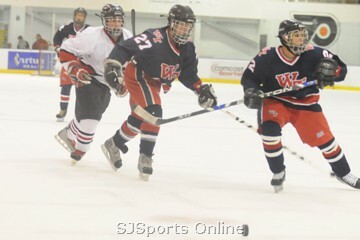 Cherry Hill East was unable to capitalize on a two-man advantage for a full two minutes and Cherokee scored four goals in the third period to break open a close game and won going away, 8-2 in high school ice hockey action played at the Skate Zone in Voorhees. Trailing just 3-2 with less than five minutes remaining in the second period East went on the power play with a chance to tie and possibly take the lead. But they never got set-up in the offensive zone and failed to generate any shots on goal.